Dan Walker is the Bible-believing son of a Baptist minister. He is a TV and radio sports presenter who has just been appointed to front the BBC Breakfast programme following the retirement of Bill Turnbull, who wants to spend more time with his bees. Those are the facts. The media furore surrounding Dan Walker’s appointment has been quite extraordinary. That is another fact. One expects it from the Guardian. They carry a sneery piece today by Catherine Bennett – ‘Dan Walker: it’s tricky to trust a presenter who feels God got him the job‘ – which is replete with religious illiteracy, derision, caricature and snooty barbs against the Bible-believer: how can anyone be so moronic as to believe that God – God! – has a plan for his life? “Walker is the kind of media disciple who, if he lacks the official authority of, say, a Rev Richard Coles, our own Rev Giles Fraser, or their colleague, HSBC’s Rev Stephen Green, more than compensates for this lay status with assertions of inflexible faith,” she writes, with all the hyper-flexible journalistic tolerance of Richard Dawkins on dogma-enhancing steroids. There’s nothing so insidiously hypocritical as someone who is absolutely right lampooning those who are absolutely right. So much for the Guardian; now to the Telegraph. They published a piece a few days ago entitled ‘Dan Walker’s creationism is an affront to reason, science and logic‘, with the strap line: “The BBC has done nothing to explain how someone who believes in the literal truth of Genesis can present the news accurately.” Seriously? Does the BBC really have to explain why religious belief ought not to be a bar to employment by a public body? The article is written by Rupert Myers, who happens also to be a barrister. With that, you might expect intellectual rigour, sound judgment, impeccable integrity and the ability to ascertain crucial facts and present complex matters succinctly and fairly. But what you actually get is a sub-Guardian – even sub-GCSE – level of religious literacy, derision and caricature. It is such a diatribe of anti-Bible-believing-Christian prejudice that it is incredible (quite literally) that the Telegraph, which is owned by devout Roman Catholics, saw fit to publish it. A belief that the earth is between six and ten thousand years old, and that presumably God planted dinosaur skeletons in the ground to give us all something to talk about, goes well beyond the values for which people of faith can demand respect. The only difference between creationism and a church you could set up tomorrow which believes China doesn’t actually exist is that creationism has been around for a longer period of time. Sexism, too, has quite a vintage, but we do not accord it respect for being old. Presumably Rupert Myers is a non-creationist type of Christian: “To believe that God literally created the earth in six days is to deny basic elements of logic,” he writes infallibly, as though the belief that a wafer may be made into the literal body of Christ at the command of a priest were a scientific transubstantiation wholly in accord with the basic elements of logic. And so, absent a rigorous defence of this appointment by the BBC, the inference is that Dan Walker should be swiftly sacked for his inability “to interview a paleontologist objectively, to present the latest findings on the age of perceptible space, or to discuss education or science policy with ministers”, for viewers could not possibly have any confidence in his capacity for professional objectivity. It merits a line-by-line fisking, but life is too short and the devil needs accosting. Admirable and eloquent rebuttals have been written by David Robertson, Andy Walton, and Dan Walker’s sometime friend Stephen Kneale. They cover all the primary points of logical rejoinder, and explain why such hounding of a Bible-believing Christian by someone professing to be Christian is not merely illiberal, but immoral. There is one assertion, however, which demands further comment and scrutiny, for it evidences an alarming prejudice, especially in a barrister. Myers writes: “Creationists cannot be trusted to report objectively, or to interact reasonably with their interviewees and with the public.” It was politely suggested to him that ‘Creationists’ might here be replaced with ‘gays’, ‘Muslims’ or ‘Jews’ (for the BBC employs lots of these, combined), who might be tasked not merely with presenting the news (or ‘religion and ethics’ programming), but selecting which stories are deemed worthy of coverage and devising angles for public presentation. Myers, a barrister (did you get that? ), took a philosophically valid and perfectly logical substitutional device (philosophical parallelism, which some call ‘Whataboutery’) and turned it into an allegation of homophobia or anti-Semtism. And so all debate is muzzled, as ever it is when ‘-phobe’ is hurled or ‘hate’ alleged. Indeed, even ‘Whataboutery’ has become a slur to silence critics, akin to ‘bigot’ or ‘conspiracy theorist’, as though no discrimination may any longer be reasoned, and no political or religious agenda pursued covertly. 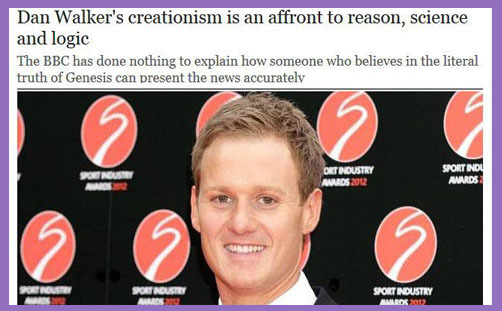 Not all creationists are ‘young earthers’, though it is doubtful that Rupert Myers (a barrister) had the courtesy to phone Dan Walker to try to discern fairly the facts of how he reconciles science with his beliefs, and so discover what type of creationist he is. He seems intelligent enough to be able to count the rings in a tree trunk. But even if he believes in a six-day creation by faith, what business is it of Rupert Myers? Who is he to demand that the BBC separate the logical-scientific-materialist sheep from the myth-believing goats? Faith may be reconciled with evolution: creationism is not necessarily incompatible with the known facts of science. Perhaps Rupert Myers would like all those Christians who happen to believe in a literal Adam and Eve to be barred from jobs which demand the ability to grasp hard facts and apply logic. Of course, Jews and Muslims who hold such a belief will be exempt from the inquisition, under the protective aegis of ‘-phobe’.